View daily modifiers and activities/bounties that reset daily here. Activate all 9 plates and kill all 3 ogre’s that will spawn in the middle. 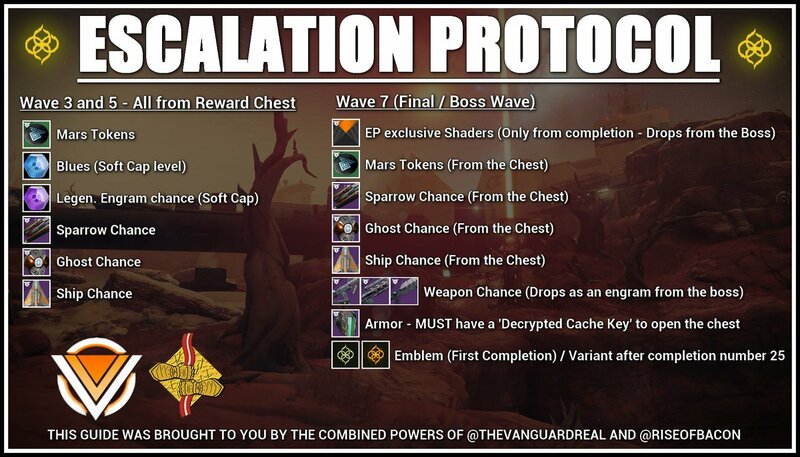 Do this every phase until Kalli is defeated. Challenge Requirement: Relic holder may only shoot one flower each per damage phase. 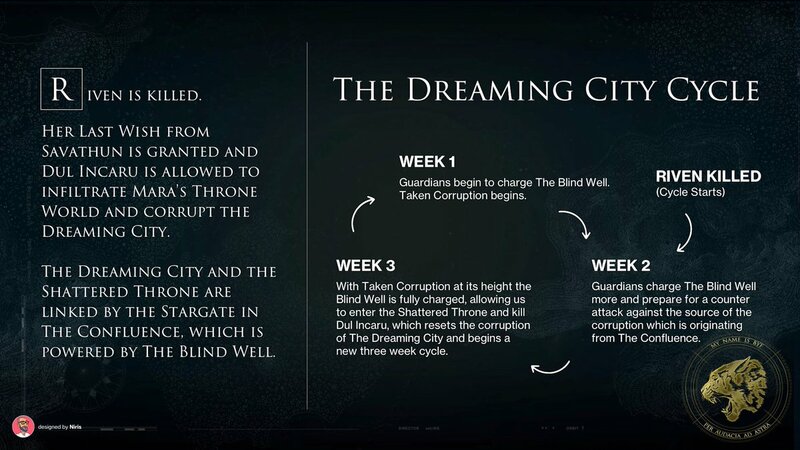 The Dreaming City. Hunt down one of Queen Mara’s most trusted advisers and free her from Taken possession. Begins on October 16, 2018, with a celebration of lost heroes and a new challenge to tackle. It includes a costume party, and you’re all invited. It ends with a quest to solve a murder. Be on the lookout next week for a full reveal via the Bungie blog. The following changes are currently in development for Destiny 2 Update 2.0.5, planned for October 30. If any issues are found in the course of that work, changes may be delayed or tweaked accordingly. Make sure to stay tuned for future updates. 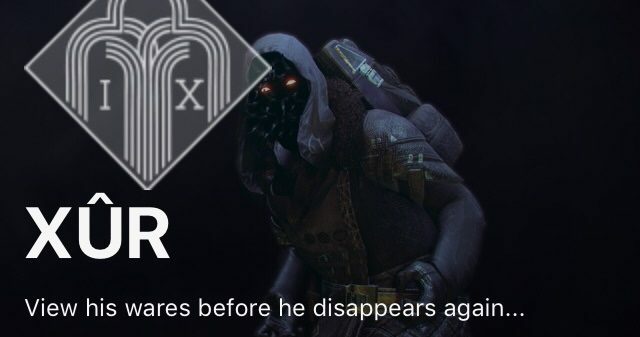 Without further ado, here’s what you need to know, coming directly from the Gambit team. Malfeasance Acquisition: We’ve heard player feedback concerning the spawn rates of the Ascendant Primeval Servitor, and we are making adjustments to how frequently it will appear. During week three of the curse cycle, also known as a full-curse week, the Ascendant Primeval Servitor will have almost the same chance to spawn as any other Primeval. We will also be increasing the chance for the boss to spawn during lesser-curse weeks, but it will still be lower than during a full-curse week. For full transparency, since the Ascendant Primeval Servitor spawn rate will increase significantly when these changes are released, we are tweaking how ship and Sparrow rewards drop from the boss. Vanity items are no longer guaranteed drops for subsequent boss kills after you earn the quest, instead the vanity items will now only have a chance to drop. Quitter Protection: We are currently developing a change to Gambit matchmaking that will help with the extended load times some players have been experiencing. When this change is released, we will be re-enabling quitter penalties for the Gambit playlist. However, we have increased the number of games players can leave before they are restricted from the playlist. We are making this change to help mitigate some situations where bad internet connectivity results in a restriction. The Gambit team is closely monitoring community feedback and looking at game data. In future updates, you should expect changes to Gambit bounties, how frequently you earn rewards, and other changes to the mode that will give teams in the lead a greater advantage. We’ll be back in future weeks to shed more light on the future of Gambit as it continues to evolve. Last year, we used Roadmaps to telegraph how Destiny 2 was going to evolve. In the months to come, our plans for the Seasons and the Annual Pass are the items worth illustrating. That doesn’t mean that you won’t receive updates that address the issues you’ve been talking to us about. Here are some downloads that we hope are worth putting on your calendar, as well as a quick preview of what to expect from each of them. Destiny 2 Update 2.0.5, tentatively scheduled for October 30, 2018. Please note, the changes listed below are currently in development. These could change, be impacted by delays, or cut if issues are found. Stay tuned for updates! Expect more details on the blog for each update in the coming weeks. The Shattered Throne will return on October 16th for guides and more details click here (image above by @nicregis). View: Forsaken Guides | Last Wish Raid Guides and Loot.